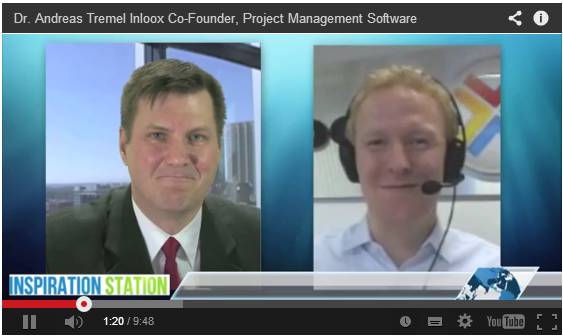 Andreas Tremel, co-founder of InLoox, shared the InLoox story: How the company got started and it's development into an international provider of project management software. Entrepreneurship.com's Inspiration Station is a place where entrepreneurs share their inspiring stories and ideas. On the last show, Andreas Tremel spoke with Kersten Kroll about the beginnings of InLoox and it's international success story. When Dr. Tremel and his business partner started creating and using their own project management software to enhance standard software on their computers fifteen years ago, they did not even intend to go into project management software sales. Visitors to the office noticed the innovative project management solution and asked to implement it in their own companies. What started off as a small private project had a very public market. The idea quickly started to take off - despite the concerns of disbelievers. Mr. Tremel's advice to young entrepreneurs: "Do not listen to sceptics. When we started out a lot of people said that it is impossible to have a project management software built into Microsoft Outlook. They also said 'Who needs that? That's never ever going to work.' Our story proves that it's not only possible but it works just great. So, do what no one has tried before and be bold." Mr. Tremel also speaks about the major challenges in project management like effective information organization and how InLoox project management software solutions can support project managers and teams in their everyday work. Watch the entire video on Entrpreneurship.com. An Entrepreneurship Story - Andreas Tremel of InLoox in an Interview with Entrepreneurship.com - InLoox • Copyright 1999-2019 © InLoox, Inc. All rights reserved.